[XPB-515] Toilet Tissue Dispenser is constructed of Stainless Steel with a satin finish. 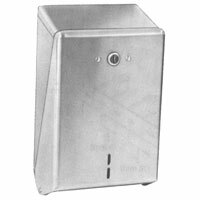 Paper dispenser is surface mounting and features a vandal resistant tumbler lock with a hinged access door that swings down for easy filling. Tissue paper dispenses 700 double fold sheet tissues and the door face features a refill indicator. Tissue dispenser is ADA compliant. Specifications and details are available upon request. For shipping quotes, orders or questions please call our Customer Service Center at 1-877-483-9270.